The multi-faceted soprano Miwako Handa's recent interpretations of Mahler's Fourth Symphony and Ravel's Shéhérazade with the Tokyo Metropolitan Orchestra under the baton of Eliahu Inbal were celebrated by the Japanese press and enthusiastic audiences alike. In 2009, composer Toshio Hosokawa singled her out for the central enigmatic role of Hanako in his recent opera Hanjo, which she performed in Suntory Hall (Tokyo) as well as in the MITO Festival in Milan and Turin. 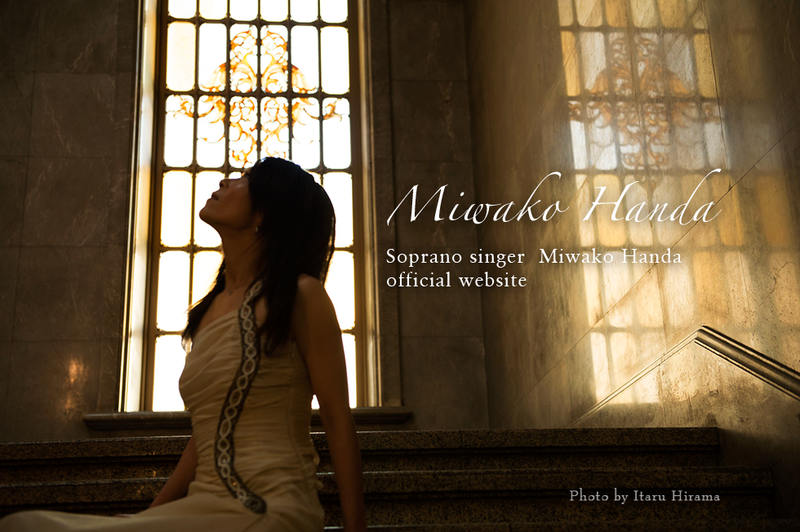 Miwako Handa is a frequent guest with the NHK Symphony Orchestra, Tokyo Philharmonic, Tokyo Metropolitan Symphony Orchestra, the Kanazawa Ensemble and the Yomiuri Nippon Symphony Orchestra. Appearing in the past seasons with conductors Herbert Blomstedt, Manfred Honeck, Eliahu Inbal, Tadaaki Otaka, Jun Merkl , and Gary Bertini, Handa has been able to highlight her versatility extending from the light and agile to the lyrical, eloquent and emotional with a range of repertoire including the Mozart Requiem, Mendelssohn A Midsummernight's Dream, Rossini Stabat Mater, the Fauré Requiem, Beethoven Ninth Symphony, Poulenc Gloria, Mahler Symphonies 2,4, and 8, Orff Carmina Burana, Berg Lulu Suite, and Villa-Lobos Bachianas Brasileiras. Equally at home in opera, Miwako Handa's roles include Susanna (Le Nozze di Figaro), Nanetta (Falstaff), Musetta (La Boheme), Adele (Die Fledermaus), Euridice (Orpheé aux Enfers), Serpina (La Serva Padrona), Gretel (Hänsel und Gretel), Lauretta (Gianni Schicchi), and Hanako (Hanjo.) In 2007 Miwako Handa sang the role of Susanna for the NHK New Year Concert live television broadcast, and appearing on the NHK's "N-Kyo Hour" she has sung Mozart C-Minor Mass and Mendelssohn A Midsummer Night's Dream with Jun Merkl. In 1999, she was awarded both the First Prize and the Fukunaga Prize in the Fujisawa Opera Competition; she additionally received the Sizuko Kawasaki Prize presented by the Nikikai Opera Studio. Miwako Handa's recent recording of 'Un bel di' from Madama Butterfly by Puccini was featured in the film Nodame Cantabile, and is currently being released on Epic Records. Her discography also includes Mahler's Fourth Symphony with Eliahu Inbal two versions of Mahler's Eighth Symphony with the Tokyo Metropolitan Symphony Orchestra - one with Gary Bertini and the other one with Eliahu Inbal, and a Johann Strauss album with the Kyushu Symphony Orchestra.